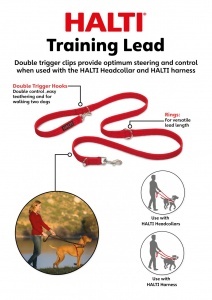 Multi functional lead designed by Dr Roger Mugford to simplify the training of your dog. The short length is ideal for heelwork training medium length for obedience training and the long length for recall and distance work. Alternatively you can use the double ended lead in conjunction with the Halti for light steering control or simply as a normal every day lead. 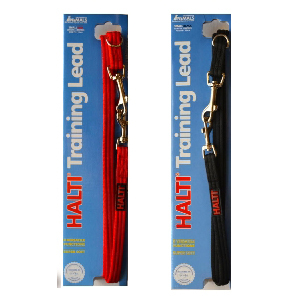 Made with soft padded webbing for extra comfort the Halti Training Lead comes with a free training guide. Large size. 2 metre length.